Join us for a presentation at the Royal Treatment Fly Shop. 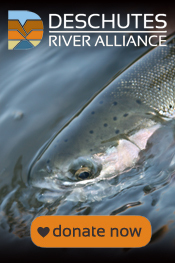 The presentation will focus on the latest monitoring research and updates by the Deschutes River Alliance. On October 1, 2015, the Low Impact Hydropower Institute (LIHI) awarded the Pelton-Round Butte Dam Complex a Preliminary Certification Decision with the operation having been determined to meet LIHI low impact criteria. Conditions were noted in this recertification. Those conditions in the proposed recertification and the letter of notification can be found here: PRB Certification Decision Letter. We ask that our supporters read the appeal document (linked above) as it contains a great deal of information regarding dam operation, water quality in the lower river, and fish reintroduction. It also contains some important details about how Oregon Department of Environmental Quality manages water quality on the lower Deschutes River. Please let us know your thoughts and comments. We’ll keep you all posted as to the outcome of the appeal process.